The huge list is here and this is all about free social media icons for your websites or you can use it just as a collectors pack of icons to add to your existing collections. The quality was taken into consideration and you can see that almost 100% of icons here will be psd or in ai, eps format which will provide high-quality output. You can check every one of these icons to match your design project until one suits you the best. Light theme websites will be completely benefited with this list as most of them will suit right away with the theme without many alterations. Premium themes will come packed with a good set of social media icons which you can use right away but it might not interest many of us. These free social media icons can be used to gain fans on a social media network through applications, games, website either its for the mobile app or tablet. Social sharing is given high priority by major search engines so you must start becoming social with your clients, visitors through regular interaction. Website with high bookmarks in social media will rank better these days. We have covered almost all cool icons from this year 2017 and 2018 and also the best from the previous years. This list will be updated with new icons everyday, so stay tuned. Looking for some modern long shadow style icons for your websites, ui app in flat design? Here in this PSD download, you will find a set of 18 flat icons with smooth shadows. This pack is exclusively designed for you by designseer and it can be used for commercial purposes as well. The icons come in dark and light color scheme to match your website. All icons are in png format for fast integration into your blogs, business websites. If you fancy the modern Google material design then this free icon set is your answer for social sharing icons. This set has six most popular social network sites – Google Plus, Facebook, Twitter, Swarm, Dribble & RSS. Having a hover selector for social network icons is essential and this design is not found in any recent freebies. To reduce your workload we have designed two stages of icons: normal, hover which will be useful for your projects. Share this freebie and let others know as well. 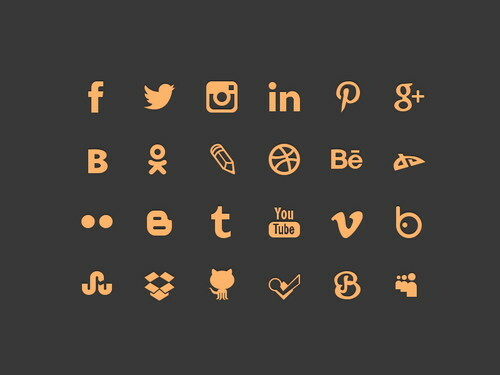 A collection of 54 icons for nine major social networks you might use for any purpose. This freebie is designed by Christophe Kerebel and made free to download. These small icons will look great on your navigation menu and in your footer sections. When you are selecting social media icons it is vital that you select the right color, design, size and the visual layout of the icon. Although the internet is flooded with thousands of different icons the flat icons have a different charm about them; they are simple yet elegant to look at. Despite them being free their quality is appreciable. You can integrate them into your WordPress blog, website or portfolio. 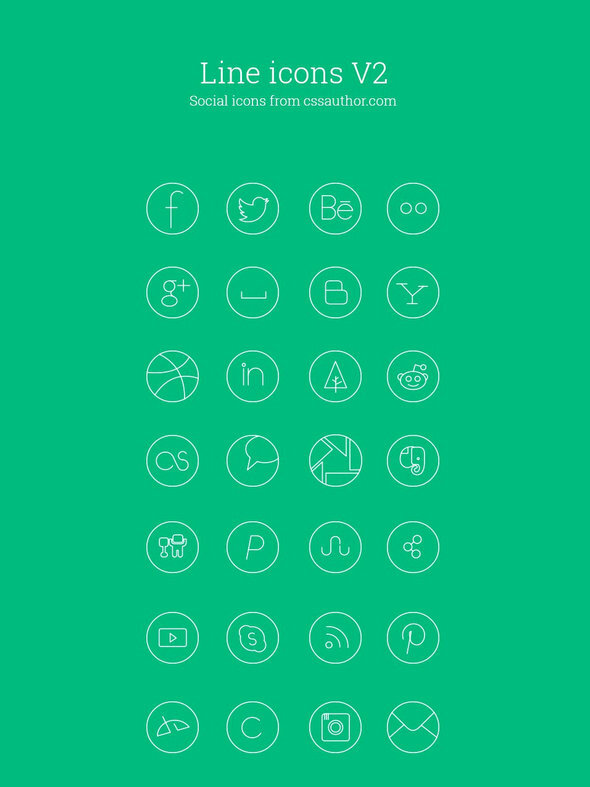 A complete pack of black social icons for every social platform that is popular today. The pack includes 120 vectors icon files and also comes in a variety of formats. The icon sets from Picons are concentrated to offer the highest possible quality. Founded by Morphix Design Studio in 2009, they have been designing and offering premium icons since then. All the icons made by them are accurately handcrafted, exceptional and distinguishable; made for all users whether it is a developer or a graphic designer. Picons icons are simple and easy to recall. Whether it is a desktop app, offline media or a mobile app their icons seem to add value to your design. Format: PSD, ai, eps, png, csh. Another version and style of icons for designers who want a single color icon style for their website. Get this free PSD file and use it for any purpose. Icons by Elena are really cool. They are of the perfect shape and absolutely free for you to download. The set has platform icons for iOS, WP, and Android, besides the regular Whatsapp, Facebook messenger icons there are icons for Slack, Viber and more. She also offers icons for services like Deviantart, Foursquare Google + etc. Like thin line icons? Then this set of vector icons is just for you. The pack is well grouped with png resolutions and easy download. Everyone loves the good old square shaped icons. They look sleek and decent, and are absolutely free for download; you don’t need to promote the developers work as well. You can use them for commercial purposes or personal use. Every icon is carefully handcrafted and is available like a large share button with 32 and 16 pixels. A free design by Alexis Doreau which contains a set of 50 free icons with png exports of multiple resolutions including 24, 48, 96, 144px. The download also contains illustrator ai file for maximum output for your design. All major social networks including WhatsApp, messenger, Instagram etc can be found. If you are looking for something really subtle you are going to love the designs from Alexis. All the icons created are pixel perfect and has given a fresh look to all his creations. The clean flat color design makes these icons look good on any business websites and blogs. This modern developer has simply changed the way social icons look and offers the best of his designs which will make your website look classy. A vector set of 56 icons which are handcrafted for your modern website which requires a change over boring flat icon designs. Hand drawn icons have been created by GoodStuff, and once you see them you will understand that they have really made some good stuff for you to use and is absolutely free for download and use. The set contains PDF, EPS, and SVG vector formats. Additionally, every icon has been saved as transparent PNG in two sizes 128×128 pixels and 64×64 pixels. You can use them either for work or personal use. Outlines are great design variation compared to others as these borders can produce a high visual appeal and simplicity. So we included a thin set of outline icons which is designed in Photoshop which can be put to great use. This set covers over 28 social sites which you might be looking for. Grab this amazing line set for free. These simple line icons made to look like fonts and will be look perfect for websites where you need animatedly scaled icons which give a spotless and a sharp look with absolutely no pixelation. Beautiful things are not always required to be complicated; sometimes a simple touch brings out the authenticity of things. These icons can be stated as “simplicity at its best”. A collection of outline icons designed to create a stunning visual impression on your visitors. This thin set will look great on the top navigation and footer menus. These icons have been inspired by iOS 7. They are available in vector, eps, ai and SVG formats and in Photoshop also. There is an attribution required if you want them for free else you need to become a member of their site or purchase the full version. These slick icons are very cool when used in the top header navigation and also look good in the footer section of the website. Grab these free PSD files which are vector layered for high-resolution output in designs. Download free social media icon set made with Photoshop and illustrator available in png, vector, PSD formats. Circles look cute, don’t they? Well, these social icons will look good on your website irrespective of their positioning. If you are looking for a change from the regular square shaped social icons you can always opt for the circular ones. They are free to download and will do a wonderful job of beautifying your website. A set of icons for 20 bookmarking sites with over a variety of styles and around 150 icons to download. Grab this free icons pack for any purpose of usage. Say what the flat design has undoubtedly become a fashion everyone wants to keep. The balance between the layout of the icons and the mix of pastel seems perfect for any webpage. The pack created by Martz90 with the Deviantart portrays over 150 free circle icons for all of you to download. It will definitely increase the charm and beauty of your website page. With fat design being the color scheme of this decade you can see flat icons being designed by most designers. This looks great on use with a single colored background. Trends will come and go but the minimalistic designed icons always stay. Minimalistic and glyph type icons will always be the most common icons to be used. They are extremely scalable for user interface and come with CSH file, PNG, and Photoshop. A download set of hexagonal style icons and buttons for your website. There are times that you have the icon of your choice but you haven’t been able to get the right shade of the icon. If you have a perfect site up and running you would definitely want everything in it to be perfect. Why compromise with the color of the icons? Hex has the perfect solution for you. The developer has compiled a list of top sites of icons that are normally used and put the right color coding to it. You can use it for free and they are just perfect. This set has real box icon feel to it with sharp edges. There are so many kinds of designs of the icon set and the Free Boxed Social Media Icons is one of them. It is a collection of flat social media PSD and all these Flat icons come with a very simple style. This freebie includes 45 pixel perfect subtle social media icons. You can edit each icon to your own colors and resize them to your liking. This download is one of the many designs created for the business and personal use. The icon is styled along with Photoshop vector shapes which can be easily edited and resized according to your needs. You can download them for free and set it up on your website page.The reviews for the Subtle Social Media Icons are amazing. Jorge Calvo is a graphic and web designer with over ten years of experience and has designed many cool designs and provided theme for free as well. This set of icons is one such brilliance of Jorge with minimalist icons and flat design scheme. Out of all the numerous designs the internet has to offer these flat icons are subtle and will compliment your brand the visual branding of your website. This is a collection of beautiful icons developed in the flat style. As you already know, we have issued several UI kits in the flat design style, namely Square UI. There are over 24 styles which you can select. It is like a one box with all the choices for you. The icons are square and in circle shapes; you can select either one for your website whichever looks good and goes with the theme of your website. You also have frameless and with border icons which you can select from. I made these flat basic icons for a personal project and thought I’d share. These icons look wonderful, have already had numerous downloads with wondrous reviews. Dribble, YouTube, RSS, Paypal, Spotify, Vine, and Sound Cloud, you name the social site icon and it is there for you in this set. A beautiful collection of colorful icon set created based on the flat design trend. The icon set includes some of the most recognizable companies including Google Chrome, Gmail, Skype, Dropbox, and others. There are 20 flat colorful social icons in this set in vector PSD format and are available in the 128×128 pixels size. They are free to download on the internet and are inspired by Google icons. All the layers are full vector based so you can edit, color them easily. You can use them for your personal use or work purpose. 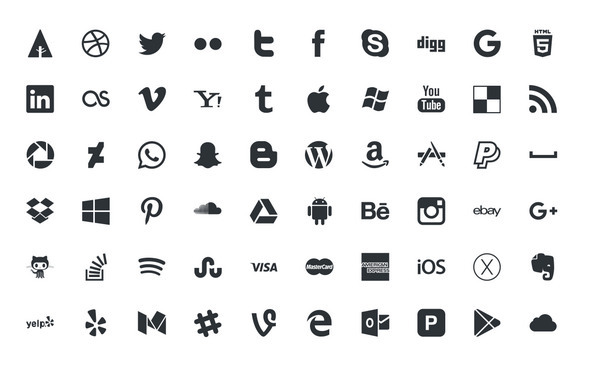 The social icons above (28 icons in total) are available to download for free. The original PSD is included and all the icons are named and super easy to adjust/update. You can easily distinguish between all the social media icons because they have been named. The icons are wonderfully easy to adjust as they are on PSD format and you can integrate them in your website, the social icons are attractive to the eyes and will welcome more traffic to your connected social sites. Today’s freebie is a Icon Set containing 18 icons in JPG, PNG and PSD format. 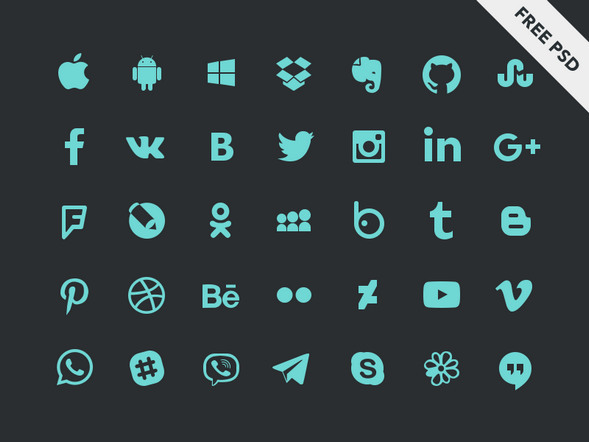 The IC Mini Social Icon Set is completely editable and the icons come in 32×32 pixels size. These tiny icons are decent looking and sort of look cute. There are Dribble, RSS, Twitter, YouTube, LinkedIn, Tumblr, Share-this, Digg, Behance, Vimeo, Github, Last-FM, Flickr, Ember, Evernote and Forrst. You are free to download them for business purposes or your personal use. Mini Social Icons will give your website or blog an attractive look, download them from the internet for free. All these icons come in PSD format and are all vector shapes showing beautiful glyph icons in design. Mono chrome design with pure white or in grey color can come in handy. Here you find find white glyph icons for your favorite social sharing websites. These 64 beautiful are all made in PSD and Photoshop vector shapes so you easily customize and resize the icons as you want or as required by the website. The social icons come in transparent PNG format for speedy use. They have excellent reviews from its users and they are free to download. 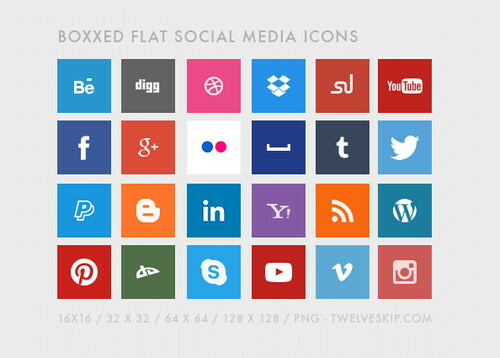 Pack of 34 simple social icons in .png format. Available in 48×48 resoliution. They are a decent looking set of social media icons which are easy to integrate in your website. They look crisp and have the entire common social sites icons that you think of. Twitter, Pinterest, Vine, Facebook and all the sites that you can name. Since they are PNG enabled they can be used quickly and hassle free. A wonderful pack of 34 they will not disappoint you once you choose to download them for use. These set of 20 icons come in two different sizes114x114 pixels and 57×57 pixels and are retina ready. They are especially meant to be used for iOS devices however they can be easily integrated with Android apps, websites and Window applications. Each icon has been saved in transparent PNG image organised in appropriate folders. You can resize the files with ease and fit them into your choice of devices. Clear Rounds contain 14 PNG icons and one PSD file. The PSD file is as always labeled and neatly organised. 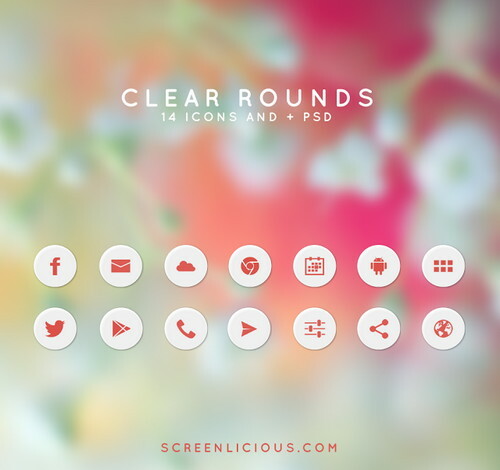 Clear Rounds is a freebie which includes standard social media icons and are fully vectorized. The zip file includes the PNG and PSD files and you can use them freely for your business website or integrate them in your personal blog or project. Icons like Facebook, LinkedIn, Flickr, Twitter, Pinterest, Spotify etc, are included in the pack of 14 icons. A brilliant set in vector format for free download and use. This free set contains icons for wordpress, vimeo, flickr, behance as well other than the regular social websites. Unlike the regular circle and square shapes these icons are polygon in shape making them stand out of the crowd. They are made in the exact colour of their websites and are retina friendly. There are many testimonies on the internet to justify my words, besides their unique shape these icons are look bright and will easily blend with any background of your website. A orange colored icon set foe social media networks. Normally one would opt for coloured social media icons do that the viewers might easily identify them. However using single coloured icons for your website will make it look different from the other websites. Simple and refined is best for perfecting your visual branding. Streamlined one-colour approach on the footer of your website will add class to your website. There are many companies who have already started integrating one coloured icons to their websites and are successfully getting better responses and traffic. A set of 12 social icons with interesting real colors along with a grey color set will have you interested to use this psd, png file on your website. The IC Circle set of Social Icons PSD is completely layered and editable; you can increase or decrease the size of your icons according to the requirement as they are full editable. They come in 48×48 pixels in PNG, PSD and JPG formats. The icons include Digg, Dribble, Google+, Skype, Twitter and other famous applications or social media websites that you know of. The circle shaped set of media icons are beautiful and are outstanding enough to attract the reader’s attention to themselves. This set of icons has been designed by Mike Fortress. It comprises of all the popular web based products and services and it is very simple to display these logos on your blog or website. 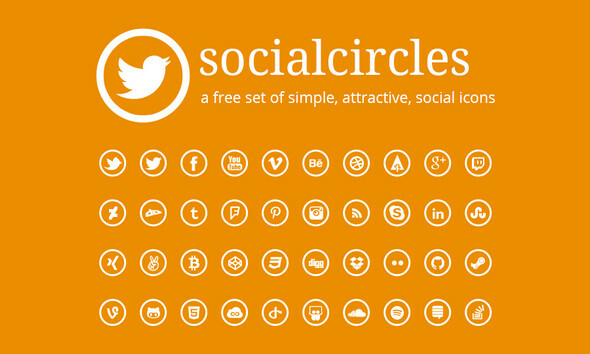 The Circle Social Icons Set is free to download and available in PNG and PSD formats. You can use the icons on your Windows or Android or iOS they can easily be stretched and sized accordingly. 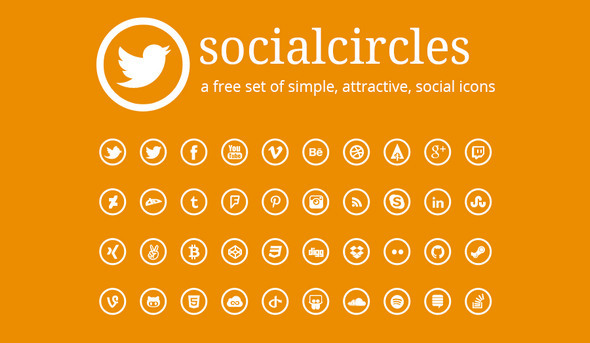 Circles look great in a website for social media icons. This set is brightly coloured and makes each icon look beautiful. The set is free to download and is available on the internet for download. You have as many as 48 different icons of common websites and applications. The icons are displayed in big white circles and are organised and layered in PSD file. You can reshape and customize them as you want. You have the option to change the colors, size and effects of these icons to match and integrate them into your blog or website. Hey there! We have created some unique designs to this list and stay tuned for more flat social media icons in the future. Thanks for these! Although it’s a new post some of these icons are dated. Just be aware that few logos in these sets are dated, and as a designer be careful which ones you use. For instance, the instagram logo in a couple sets is a few years old. Thank you for this awesome collection of social media icons.i like each of them.thank you.so much.